Another Audax season about to close – and the new one to start. Our first local events are the Celtic Coastal and Celtic Canter from Connor Downs on 23rd October. I have added a GPX file for the Celtic Canter route, but note that you will have to change the extension (from .txt to .gpx) as this web site won’t accept a GPX file upload. The file is also available (with the correct extension) from the Facebook group here. There is also a downloadable poster you can use to advertise the events. Update 18 October: GPS navigational files now available for the Celtic Coastal. 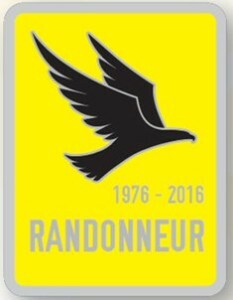 2016 was Audax UK’s 40th year, and there are some special commemorative badges to celebrate. We had a number of first-time and existing randonneurs this year who are entitled to the one on the left, and at least one local rider will be receiving the “40@40” award (that’s over 40 points – 4000km – in events of 200km or more). 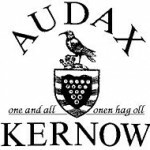 Plenty to celebrate for Audax Kernow too. We’ve had some cracking events and most of the organizers have obviously been sacrificing appropriately to the weather gods. Lots of new riders and people extending their distances. We provided the Penzance control for the Kernow and South West 600 and our TLC was very much appreciated. And we now have a Facebook group to help everyone keep in touch. This entry was posted in Completed Events 2016, News. Bookmark the permalink.